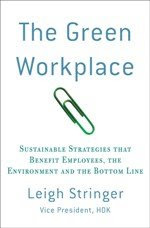 The Green Workplace: Destination: Up! We all know that elevators use a fair bit of energy and it's healthier for us to take the stairs, right? Right. Of course, sometimes that's just not possible due to personal ability or, simply the number of floors in a building. I recently wrote about the San Francisco Federal Office Building's every-third-floor elevators - which I think are great. Today, I learned about another trend in elevator operations: a destination-dispatch system. Basically a user inputs his/her destination into a kiosk/touchscreen. The touchscreen then directs the user to the speific elevator. The user enters the elevator and is taken directly to his/her floor with minimal stops. This sytem improves the efficiency for both the user (not having to stop at every floor), and for the elevator system (fewer stops, more passengers per destination). Cool article, and love the blog, keep it up! I am a small business owner and have been working in Environmental research and studies on North America and China / Asia, and have some web names for various parts of the business I have been trying to develop. The problem I am having now is that my capital is getting low and I would like to offer to sell one of my domains. I have short listed your organization since I feel this is well suited for your work and would provide the long term home for your business to grow. How About Use Less Oil? Missing the Boat with Net Zero?